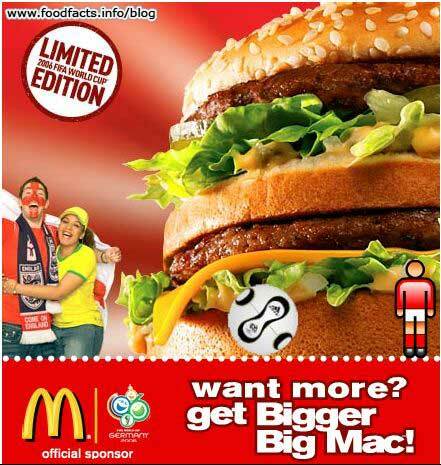 In what can certainly not be considered a healthy move, McDonald's is selling a special "Bigger Big Mac" in select European countries (including Germany and the UK) during the World Cup. This beast is exactly what its name implies and comes as somewhat of a surprise to me. McDonald's has, at least in the US, seemed to avoid the trend of offering increasingly gigantic menu items, like BK's Ultimate Double Whopper and Hardee's Monster Thick Burger. But then again, I've suspected McDonald's attempt at a health image has been motivated by fears of obesity lawsuits, something less likely in the EU. The "Bigger Big Mac" most likely will not make it across the pond. The "Bigger Big Mac" is exactly this much bigger than the regular Big Mac: 221 more calories (714 calories instead of 493), and 11 more grams of fat (34 grams of fat instead of 23). 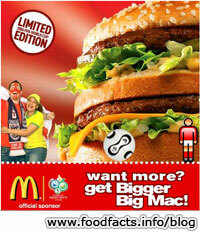 in Germany we don´t have the bigger Big Mac right now, what we have during the Championship is the Big Tasty Chicken. Hi, we in Portugal have that at least since the beginning of this year, but in here it's called a Big Big Mac. yo, the vey last zero in your post shouldn't be there.